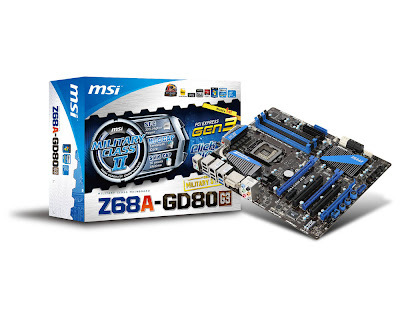 Renowned motherboard manufacturer 'MSI' unveiled the world's first motherboard to feature a PCI Express 3.0 slot. PCI Express Gen 3 slot provides a data transfer rate that is upto 200% faster than PCI Express Gen 2 (PCI Express 2.0) resulting in enhancing the performance of graphics cards without bandwidth limitations or bottle necking. The board is named 'Z68A-GD80 (G3)', this makes it a future proof board for handling upcoming high bandwidth cards without any compromise. Just like any other 'Military Class II' board as MSI calls its high end series, It features a graphical user interface BIOS. The motherboard has two PCIe 3.0 slots (1x16, 1x16), each provide a 2 times faster transfer rate than the current 2.0 standard with a maximum bandwidth of 32GB/s and also a PCIe 2.0 slot. Its build for the latest second generation Intel core processors code named Sandy bridge, what that means is it supports the processors in LGA1155 package. Overall the board has the same kind of specs as all the latest motherboards designed on the Intel's Z68 chipset like SATA 6 GB/sec, HDMI and USB 3.0, except for the 2 PCI Express 3.0 slots which are exclusive on this board. Well if you're worried about backward compatibility dont worry, obviously MSI Z68A-GD80 (G3) is backwards compatible with all the devices with PCI Express 2.0 or older devices already available on the market. In fact MSI states the 3.0 slot enhances the performance considerably for the new PCI Express 2.0 SSD devices by upto 13% in terms of speed compared to what other competitor main boards offer. I would love to buy that motherboard. I hope they'll released it immediately.